I know it's mid summer, but I'm still cooling off with these Christmas Cards from the beautiful Festive Holly Collection from Heartfelt Creations. Today I have a beautiful border card to share with you! Other Products: Champagne Pearl Metallic Cardstock, Green Metallic Cardstock, White Cardstock, SU Real Red Markers, SU Gumball Green Ink pad, SU Real Red Ink pad, Spellbinders Lacey Ovals Die, Spellbinders Classic Ovals Small, Vintage Photo Distress Ink, VersaMark, Wow Primary Red Embossing Powder, Sparkle Sheer Shimmer Spritz, Red Pearls, Ribbon and Button from my stash, Dimensionals, Heat Gun, Gemini. Instructions: Cut a 5” x 7” card base from the Champagne cardstock. Cut a 5” x 7” cream mat from the paper pad, ink the edges with Vintage Photo Distress Ink and adhere to the front of the card. Cut a red 4 7/8” x 7” mat from the paper pad, ink the edges with Real Red Ink and adhere to the inside of the card. Cut border using Classic Border Basics dies. 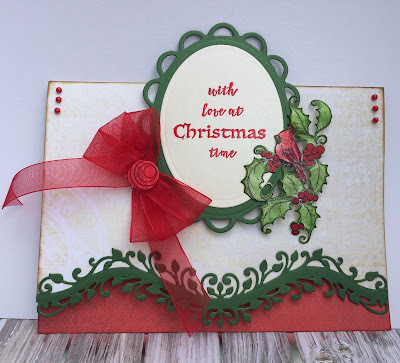 Create decorative border from green cardstock using leaf dies from the Delicate Border Basics Dies and adhere to card as shown. Cut the Lacey Oval from green cardstock. Stamp the sentiment from the Festive Holiday Cling Stamp Set on Champagne cardstock with VersaMark, heat emboss with Wow Primary Red Embossing Powder and cut using the Classic Ovals die. Adhere to the Lacey Oval and then adhere to the card base as shown using dimensionals. Stamp the Festive Holly and Cardinals stamp on white cardstock with Memento Tuxedo Black ink, cut with the matching die, color the leaves using Stack and Store Daubers with Gumball Green ink, color the cardinal with Real Red ink, color the berries with Real Red marker, shape and spray with Sparkle Sheer Shimmer Spritz. Adhere next to the Lacey Oval with dimensionals. Make a triple bow, top with a button and adhere to the card base. Add red pearls to the top corners. Thanks for stopping by and please take the time to leave a comment. Have a beautiful day and I'll see you next week with a gorgeous new release from Heartfelt Creations! Love your beautiful edge and also the sentiment popping up above the card! Beautiful! Gorgeous. Thank you for sharing this. Gorgeous - love the elegance of this card! Janet, I love the traditional color palette on this card and the simplicity of it which draws the eye to the sentiment and decorative border! Just lovely! Beautiful way to use the broader die.